The International Water Association has recognised the Waterwise Water Efficiency Strategy for the UK with a Bronze Project Innovation Award, presented in Tokyo at the World Water Congress – after fierce competition from 160 entries from 45 countries. Waterwise is an independent not-for-profit organisation based in the UK with the vision that water will be used wisely, everyday, everywhere. In June 2017 we launched our Water Efficiency Strategy for the UK. Our strategy, its development and delivery is unique in that it is a national strategy on water efficiency produced by an NGO that has then led to Government, water companies and other stakeholders taking on the delivery. Rather than being government led, this major policy project has influenced Government and water companies to require “high ambition” on water efficiency in the UK to deliver resilient and sustainable water supply systems. The strategy has led to a major policy shift supporting greater demand management, including setting personal water consumption targets for England. The steering group members remain actively involved in delivering the actions they created. 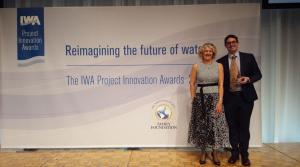 Awarded biennially at the IWA World Water Congress, the Project Innovation Awards recognise and promote excellence and innovation in water management, research and technology. After fierce competition featuring 160 entries from 45 countries, an expert panel of judges has ranked our Water Efficiency Strategy for the UK awarded us Bronze for the Category: Governance, Institutions and Social Enterprise. This was presented at an awards dinner on 18 September at the IWA World Water Congress in Tokyo.